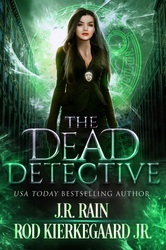 Medical-school-dropout police detective Richelle Dadd is...well, dead. But that won't stop her from trying to hold on to her house in a divorce battle with a bitter husband. Or keep her from digging into her own murder, to discover who put the bullet into her heart. Or from coming to terms with her Gypsy heritage. And it certainly won't stand in the way of finding out the reason she's been reanimated as a zombie assassin, no longer in control of her life. Richelle will face off against Romani shamans, double-crossing ghosts, a partner she can't trust, and her own undead nature in a journey into the depths of the occult world and out the other side without losing her sense of humor - or humanity - along the way.